The PD 30 removes epoxy and copper burrs from PCB’s and innerlayers. The panel is held in a fixed position by a vacuum table, which protects the panel from moving during the operation of the process. The unit is protected on three sides and overhead by glass walls. Only the front working area of the unit is open to the operator. The machine is constructed of tubular steel. The grinder moves uniformly over the board so that the complete surface is ground easily and uniformly. The dust generated from the sanding unit must be removed by an external vacuum, which is provided by the customer. A frequency converter controls the revolution speed of the unit so that fine adjustment of the sanding unit can be accomplished. Pressure for the unit is also controlled by the operator settings. 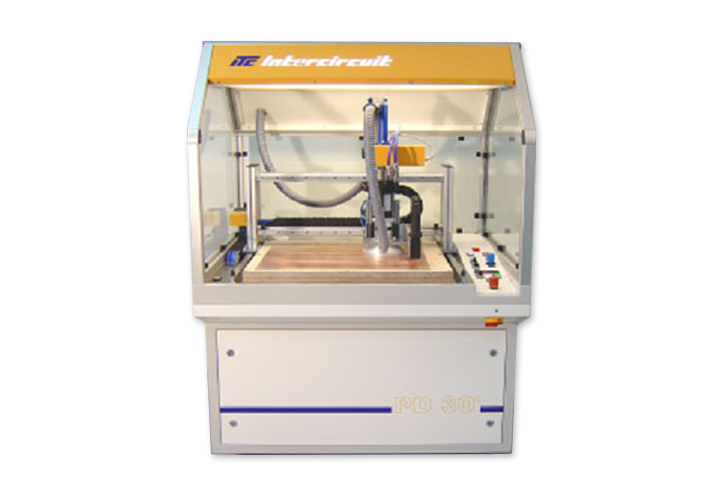 This unit eliminates the problems of over sanding in a specific area. Uniform finish with fine surface roughness. Superior sanding is achieved through sanding pressure controlled rotation and oscillation head motion.